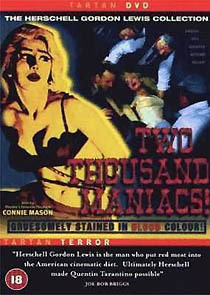 The first two parts of Lewis’ much loved, amateurish, notoriously gore trilogy, Two Thousand Maniacs! 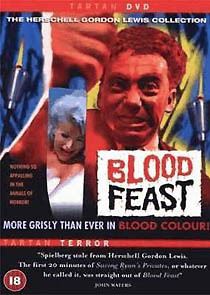 and Blood Feast, are quaintly risible, but are just the sort of cheesy movies perfectly suited to a lad’s night in. Tartan’s Region 0 PAL discs make both films look terrific, especially considering their impoverished origins. The full-frame transfers are rather smeary, but the colours are often bold and extravagant. The mono 2.0 sound (at 224kbps) is feeble and poorly mixed, and the dialogue is frequently out of sync. The discs come with a clutch of bonus features (including a lengthy audio interview with Lewis on Blood Feast), and sport nifty animated menus, but, despite Tartan’s stalwart efforts, neither compares favourably to the Region 1 versions, which come with director / producer commentary track and extensive outtakes. Fans will want to get both versions, however. Blood Feast, the subject of a successful OPA prosecution in 1994, is presented with some nominal “cautionary” cuts totalling about twenty-three seconds. Two Thousand Maniacs! is uncut.